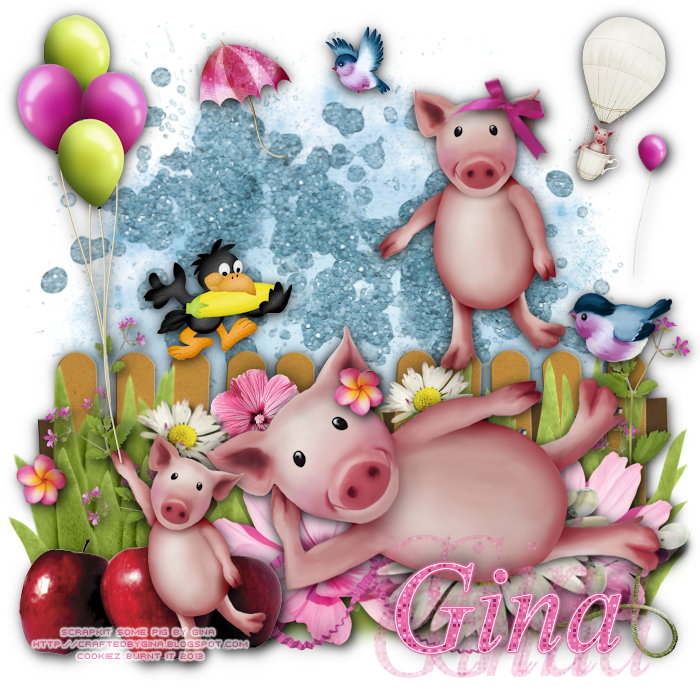 Check out Gina very whimsical kit, I love the colors and the cute lil piggies included, if you like pigs like I do than this kit is a perfect addition to your collection today. 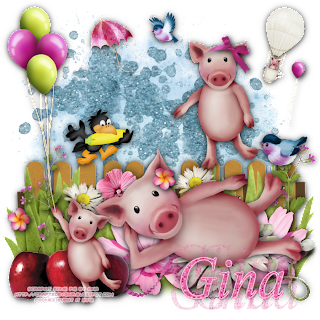 For you I have written up a tutorial from Gina's incredibly piggy cute kit. I hope you enjoy it. "Outdoor Piggies"
Next it will pop another option for you, you want to look for "Merge"--> "merge group"
Tada you now have a masked layer. Now open your cbg_somepig_glitter02, apply color change effect, Hold down Shift+L, and move your saturation bar to the color blue and re-size it to 25%, and C/P it over the top of your mask. Open cbg_somepig_fence, add your drop shadow settings, re-size to 25%, and C/P over but on the bottom of your cbg_somepig_glitter02. Next open cbg_somepig_crow and cbg_somepig_bird01, add your drop shadow settings, re-size to 15%-20%, C/P your crow and bird over and on top of your fence. Next open cbg_somepig_grass01, cbg_somepig_grass02, cbg_somepig_grass03, add your drop shadow settings, resize to 30%, and C/P all on your fence, but making sure your spread them evenly apart cover little bittle bits of your fence bottom edges without over doing it. I used a move tool to stretch the grass up, to make then look thinner but that is up to you. Next open cbg_somepig_flower01, cbg_somepig_flower03, cbg_somepig_flower04, and cbg_somepig_flower11, add your drop shadow settings, re-size to 10-15%, C/P them all over your grass, anywhere you like to place them. Open cbg_somepig_flower08 and cbg_somepig_flower09, and cbg_somepig_flower10,add your drop shadow settings, re-size to 10-15%, C/P them all over your grass, anywhere you like to place them. Open cbg_somepig_flower03 and cbg_somepig_flower11, add your drop shadow settings, re-size to 35%, C/P them all over your grass, anywhere you like to place them. Open cbg_somepig_pig04, add your drop shadow settings, re-size to 35%, and C/P him, and lay him across your bed of flowers. Next open cbg_somepig_apples, add your drop shadow settings, re-size to 30%, and C/P next to your cbg_somepig_pig04. Open cbg_somepig_crimpedribbons01, cbg_somepig_crimpedribbons02, cbg_somepig_string02 and cbg_somepig_beadwire, add your drop shadow settings, re-size to 30%, and C/P between your cbg_somepig_flower03 and cbg_somepig_flower11. Open cbg_somepig_pig02, re-size to 25%, add your drop shadow settings, and C/P your piggy on your fence like I have done mine. Open cbg_somepig_pig01, add your drop shadow settings, re-size to 17%, and C/P over your apples. Next open cbg_somepig_bird02, cbg_somepig_balloon02, cbg_somepig_umbrella, cbg_somepig_balloon04, and cbg_somepig_bird02, add your drop shadow settings, re-size to 10%, and C/P all over your signature on top of cbg_somepig_glitter02, like how I have done mine. Now Add your copyrights of your tube and your license, if your using an artist. Otherwise please add your copyrights of your scrap kit if your working without a tube.